It’s hard to believe I haven’t seen this yellow jacket wasp nest sooner. I’ve been parking my truck next to it all summer. I’ve been no further away than 5 feet getting in and out of the truck. I’m surprised (and more than lucky) I haven’t disturbed the nest banging around the truck. Yellow jacket wasps are born with an attitude problem. Individuals are aggressive and easily aggravated and anyone who offends one is usually rewarded with a sting. But that’s nothing compared to having 100s of them peeved at you for disturbing their nest. I know. I once disturbed an underground yellow jacket nest and was stung at least 50 times before I even knew I was in trouble. Before I managed to get away I had well over 100 stings. Living dangerously: Taking a macro photo of a yellow jacket nest entrance. No one ever accused me of being overly intelligent. Oh my – I can’t imagine getting that many stings! Very brave indeed to take that picture – I hope you had a good zoom lens! There’s a fine line between brave and stupid. I’m happy to say I was cautious enough not to cross that line this time. I have a pretty good zoom but I still needed to get within a couple of feet to the nest. I too have been stung in the past. Those stings smart and I give yellow jackets and hornets a wide berth. I would have assumed that this nest was hornets since my experience with yellow jackets has been from underground nests. Nice close up, maybe it will help me learn the difference. Are you still parking your truck in the same spot? I’m not sure if there is any difference between ground and suspended nesting yellow jackets. I’ve seen both but truthfully I never stuck around to notice any real difference in appearance. All I do know is one is just as disagreeable as the other. How high off the ground is that nest? 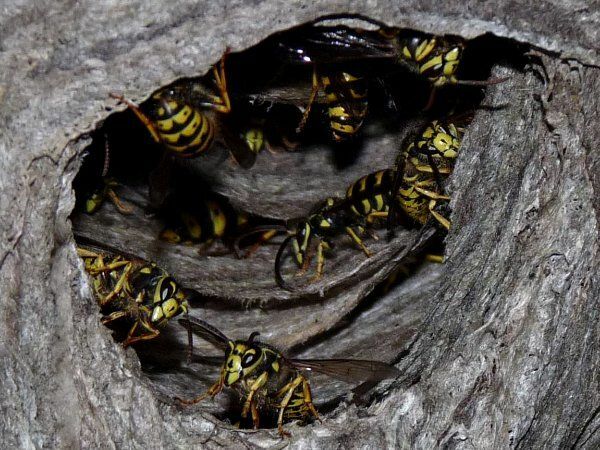 We had a hornet’s nest at a client’s well-house one year, and there’s simply no way that I woulda tried to get a picture like that… (If it would even have occurred to me). Although… I did take a nice close up of a wasp nest this year… Click my name to see that post. The nest was head height. I could see eye to eye with the entrance. Interesting to note: your link caused my spam filter to kick in and block the comment. These are bad girls no question can sting repeatedly too. Enjoyed the close up photo. Yow. Brave? or what? When we moved into this old farmhouse back in 1971, my husband and I pulled down a cheap ceiling above our enclosed “back porch,” really a cement block addition. We were immediately attacked by wasps or bees or whatever and just managed to get into the kitchen and close the door on them as they dove for us, battering the door. Since then I am not brave. Still not afraid of a stray wasp but…. seen videos of nuts smashing wasp nests before. Not as exciting as it sounds. Wow that is cool(-: I have one hanging in my house..minus the beasts. I have heard when it freezes they will leave the nest…is that true? LOL(-: The nest would be fun to keep. Every year I get stung several times by those creepy little critters. I hate them. When I least expect it. They will hide in handles of the wheelbarrows or a bird house etc. I am usually careful to check for them but sometimes I forget. I am glad you didn’t get attacked by those ones…yet…be careful!!!! The Queen will winter over in a protected nook while the rest of the colony goes “Jamestown”. I’m planning to take possession of the hive after they disappear. I don’t hate them but I do get annoyed when one goes swimming in my iced tea.